Here I sit days after reading, unable to read another book as this story STRUCK ME SO HARD!!! Hours and days after reading, just thinking of this story leaves tears that stay etched in my eyes. 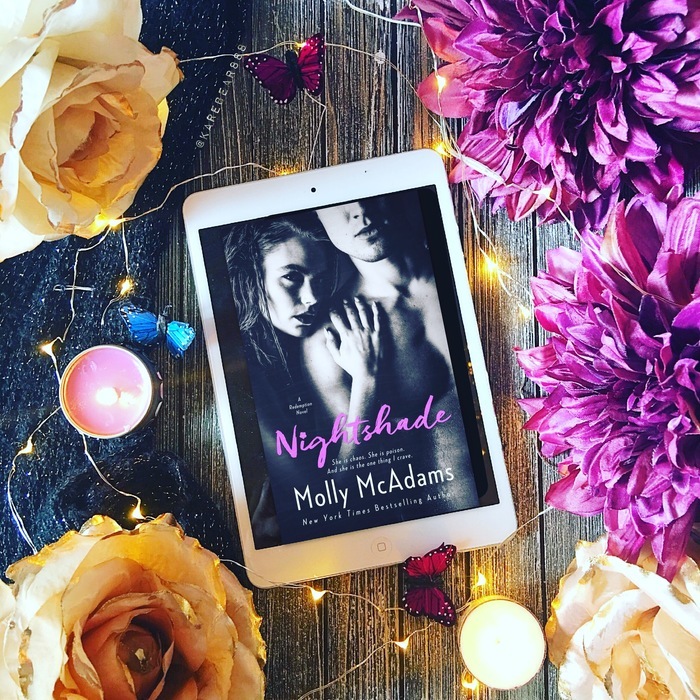 I am still STUNNED SPEECHLESS from Nightshade by Molly McAdams, a STUNNING STORY that stole, stripped, and shattered both my heart and soul. Captivating … chaotic … dark … dangerous … and devastatingly beautiful, Nightshade is the PERFECT STORM … MY perfect storm. Happiness. That word would never touch my life again. Happiness wasn’t meant for girls like me. Nightshade GRIPPED ME immediately, chasing my heart and soul like a fierce fire where I fell to the flames. This firestorm of feels was a fight I would not—did not—want to win. Nightshade both lit me up with life while casting my soul into the dark. Every breath matched every breathtakingly beautiful word. Light to light. Dark to dark. Beauty to beauty. Feel to feel. I FELT NIGHTSHADE EVERYWHERE. One page and I was ENSNARED in the trap called Nightshade. One page and I BROKE for the heroine. One page and I knew Nightshade would break me … and that it did! I wasn’t scared for my life. I was scared for my soul. From the moment I met the intensely dark knight, Kieran, in Firefly, the story that precedes Nightshade, I LOVED HIM. Long blond hair. Piercing green eyes. Tall and muscular. Fierce. Deadly. A man who would lay down his life for those he loves. A man battling darkness but is still a dark hero. Kieran, AKA, Nightshade, is the ULTIMATE HERO—-my Robin Hood! Kieran is PERFECTION!!! He was terrifying. And he was beautiful. Nightshade has met his match in Jessica. Beautiful. Broken. Bold. Brave. Jessica is as evasive and lethal as Kieran. Chaos and calm collide and what an EXPLOSION Nightshade is … a heart-pounding HIGH!!! Just so INCREDIBLY INTENSE…just so EVERYTHING!!! These sweet and soulful words MELTED ME!!! Kieran and Jessica were EXPLOSIVE together … a union of fire and ice. Their chemistry was on FIRE!!! I felt their POWERFUL PULL pull me. There was something inside her that called to me. The INTENSITY?!? I felt it EVERYWHERE!!! Nightshade had me on EDGE, my heart not beating but THRASHING out of my chest!!! Twisted. Tortuous. Tender. Tough. These words sliced through me like a knife, cutting me open. This story SHATTERED ME into many pieces. Each piece of this poignant tale took and was a part of me. My heart bled and beat for this book, a book that BROKE ME IN THE BEST WAY!!! When you begin and end a story in TEARS, one so full of PASSION, PROMISE, and POIGNANCY, where every FEEL IS FELT, that story is one that you’ll FEEL FOREVER!!! I SURRENDERED my body, breath, heart, soul, and every emotion to Nightshade. I was so LOST in this story that I didn’t want to be found. Fire and ice. Dark and light. Love and loss. Holy RUSH!!! Nightshade is the BEST EMOTIONAL CHAOS!!! This soul-shattering story is one not only read but FELT long after the last page.